By now I have collected many links about Japan, Japanese, travelling in Japan and living in Japan. When I was ordering all these bookmarks, I thought that it might give a clearer overview if I would put everything in a web-page. I don't know whether that is true, but anyway: here it is! I hope these links will help you plan your trip to/in Japan or help you enjoy your stay. In general April and October/November are said to be the best times to visit Japan. This is mainly because of the nice weather: you probably wont need a jacket, there's not much rain and it isn't hot and humid like in summer. I made an overview of pros and cons per month; if you plan to visit Japan, please check it out! anime pg site:jnto.go.jp filetype:pdf, etc, etc. Before exploring Tokyo, be sure to pick up a copy of these booklets. They are available is several languages (colors) and contain a metro/train map with station numbers, names in english and in characters, detailed maps of the most important sightseeing areas. Famous sightseeing spots are indicated and desribed shortly. They are available at many hotels, tourist spots (TCAT) and the tourist offices. Asia Rooms, good for orientation, check hotels own pages as well for best price! If you go to Japan as a tourist (90day tourist visa), it is probably a good idea to get a JR rail pass. If you make a trip Tokyo-Kyoto-Hiroshima-Kyoto-Tokyo or Tokyo-Kyoto-Tokyo + some day trips or something like that, it is surely worth it's money. Furthermore it is very convenient not having to worry about buying the right tickets every time, as that can be quite a hassle. With the JR pass you are allowed to use the super fast shinkansen (bullet train) as well (Tokyo-Kyoto in 2:15 instead of 7-8 hours!). You'll have to order the pass before you get to Japan. If you buy have to buy a (regular) train or subway ticket and dont know how much you have to pay, you can just buy the cheapest one (mostly 120yen) and pay the difference at the "fare ajustment machine" just before leaving the destination station. JReast, English page by JR with maps of major stations etc. In Tokyo the metro is probably the most practical way of transport. I you plan to use the metro a lot, you can buy day tickets for 720 (excludes "toei" lines) or 1000yen (all lines). If you think you won't get the money out of it, you can get a passnet pass (1000-3000-5000yen), which just saves you the hassle of buying separate tickets every time. To get the last bit off your passnet pass, you can insert 2 passes (or a ticket and the pass) in the same ticket gate. In Kyoto the best way of transport is usually the bus, so be sure to get a day pass for 500yen if you plan to go a little around. 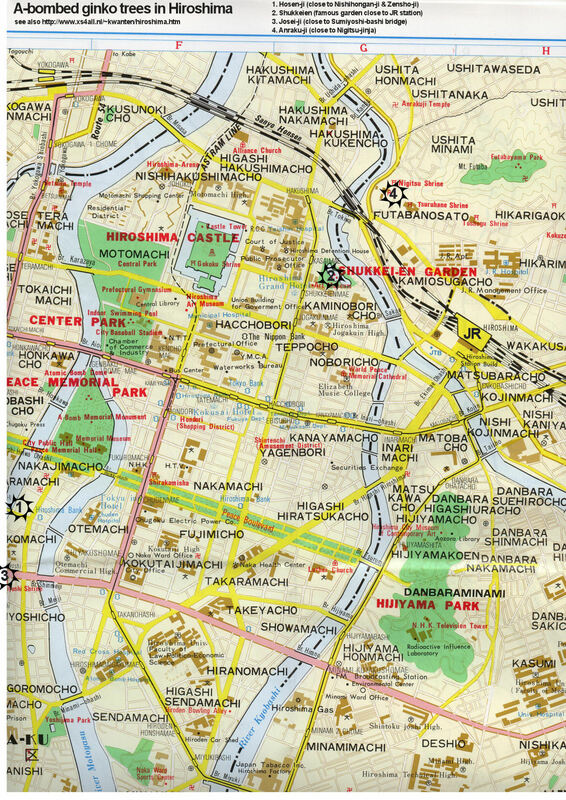 Anyway pick up a copy of the bus-navi (overview map of bus-lines) from the tourist office or as PDF download from the Kyoto City Web page. You can buy the bus passes at the bus station (in front of the JR station building) or sometimes at the reception of your hotel. (*) If you don't go at the last days of the sumo tournament, you have quite a good chance of getting tickets for the same day for around 2000yen when you go to the ticket booth in front of the stadium in the (early) morning. You will have to sit/stand in the furthest rows where you need binoculars and a good zoom lens for photography, but you may walk around and get quite a bit closer. 23 gardens with the official status of "Garden National Treasure"
1) go to the Honda showroom in Aoyama (central Tokyo), altough sometimes it my not be there due to maintanance, performance elsewhere etc. 2) go to the Museum of Emerging Sciences. Check the Demonstration schedule on their website. Ghibli Museum, Museum of the most famous animation studios of Japan. Tickets must be bought in advance!!! In the end of July and in August there are many fireworks festivals (Hanabi Taikai) in and around Tokyo. I cannot find an up-to date overview in English. If you come in this period please check the japanese sites underneath with a online translator or ask at the tourist information offices. The Itabashi Hanabi is one of the biggest fireworks in Tokyo, together with the Ichikawa Hanabi Taikai (at the Edogawa river) and the huge Sumida River fireworks (should be every last saturday of July). The Odaiba Hanabi Taikai should also be a good one. Please check the "About Japan" and "Touristic Information - Transportation" sections above as well, as they contain usefull information when you live in Japan as well. If you want to see a bit around during your stay, at least drop by at the tourist office for some maps and a schedule of events (and the Metropolis magazine).